GroupM & Mindshare win Double GOLD at the prestigious Campaign Asia 2018 Awards! GroupM Sri Lanka became the country’s most awarded media agency in 2018, successfully adding two more GOLD awards to its collection at the Campaign Asia Agency of the Year Awards held in Mumbai on the 4th December 2018. 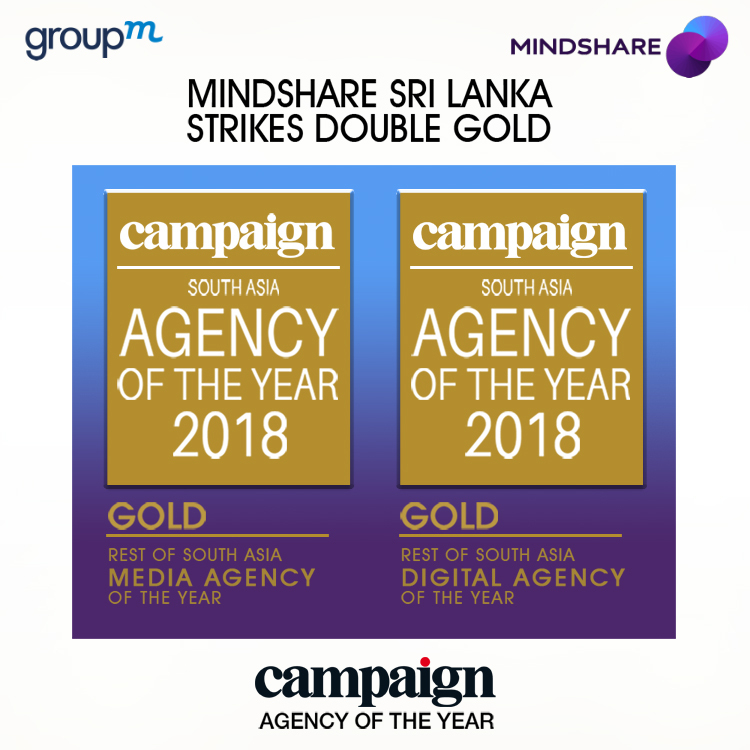 The Rest of South Asia Media Agency of the Year category was dominated by GroupM agencies, with Mindshare Sri Lanka receiving the coveted “Media Agency of the Year – GOLD Award”, as well as “The Digital Agency of the Year – GOLD Award”. Campaign Asia is the foremost industry voice in advertising and communications, with publications across five continents. Its prestigious annual Agency of the Year Awards, now in its 25th cycle-recognizes inspired leadership, management excellence, outstanding business performance and overall achievement in the advertising and communication industries. Mindshare emerged triumphant with two GOLD awards in both media & digital categories going head to head with tough competition from regional agencies and local agencies. In Sri Lanka, GroupM celebrated yet another outstanding year with its agencies bagging victories in both local and global arenas. GroupM Sri Lanka’s reputation for big hauls at the annual ceremony, honouring effective marketing communications and agency performance across the region, borders on tradition, and is testament to the agencies’ collaborative strength and established industry leadership. In 2018, GroupM agencies received the highest number of awards claimed by a media agency for outstanding performance and effectiveness, re-establishing GroupM’s stance as a trailblazer of innovation in Sri Lanka’s advertising and communication industries. As the country’s largest media investment management and consolidation agency, it has proved itself as the flagbearer of industry excellence and the trendsetters in gold standards. Mindshare is GroupM’s primary agency launched in Sri Lanka in 2006. Its success lies in the collaborative networks it builds with clients, media networks and other partners and a team of fearless professionals who work together to challenge tradition with creativity. Their specialization in marketing communications has helped them provide 360 degree solutions backed by data analytics and consumer insights, targeted towards achieving the marketing objectives of clients. The agency’s core strengths have been channelled to products and services rooted in media; performance marketing, data visualization and collaboration, new content models, e-commerce services, IOT services, budget setting and allocation, channel planning, data management platforms and data handling services. Mindshare occupies a significant regional and global footprint in media. As a full service agency in the 21st century, Mindshare redefined volume in the industry using a scale based approach to benefit clients in media investment management and was instrumental in creating GroupM. In 2012, the company coined the phrase ‘adaptive marketing’, placing agility at the heart of Mindshare’s approach alongside the three pillars – team work, speed, and provocation. The agency’s DNA is about finding new ways to work and invest and striving to stay ahead of the curve. Its professional team of experts are nurtured by world class training and development opportunities, which enable them to secure many wins for the agency over the years. GroupM Sri Lanka along with its flagship agency brand Mindshare and Wavemaker, is known to have dominated at award circuits during previous years, both in global and local media-creative forums like Festival of Media APAC & GLOBAL, Spikes, MMA Smarties, WARC, and Effies. The group’s work has also made waves at the most celebrated creative advertising forums like CANNES.